DHAKA, Bangladesh (AP) — About 450 garment workers fell ill during their shifts at a sweater factory near Bangladesh’s capital, and authorities said Thursday the water supply was suspected. Investigators from the government’s health ministry were testing the water at the Starlight Sweater Factory for possible contamination, area civil surgeon Syed Habibullah said. The sick workers suffered vomiting, nausea and upset stomachs starting about two hours into their shifts Wednesday. 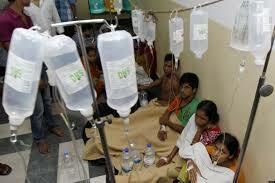 Habibullah said they were given mainly saline at hospitals and those who were improving left by Thursday. The factory gets its drinking water from an underground reservoir, CEO Mohammad Shafiur Rahman said. It’s piped to a tank on the roof of the eight-story building and supplied to each floor by jars. The drinking water is supplied separately from the building’s tap water, which workers are asked not to drink, he said. The factory that employs about 6,000 people in Gazipur near Dhaka was closed Wednesday but reopened Thursday. “We have cleaned the reservoirs overnight and now the water there is safe for drinking,” Rahman said. A building collapse near Dhaka in April killed 1,129 workers, injured others and highlighted the hazardous working conditions in thousands of garment factories in Bangladesh.